Given how hard your legs work on the bike, it’s natural to assume that when an overuse injury strikes, it’s your knees that will be most vulnerable. Surprisingly however, the research says otherwise. It seems the biggest culprit is not knee pain in cyclists – it’s lower back pain. When Norwegian scientists investigated 116 professional road cyclists and looked at the types of overuse injuries suffered over the previous year, some startling facts emerged: 94 per cent of the cyclists had suffered some kind of overuse injury during that period. What’s surprising about these results is that cycling is a low-impact sport and is often actually recommended for back pain sufferers. So why is lower-back pain so common among cyclists who spend long hours in the saddle? Correct bike set-up is crucial for back health (and we’ll come to that later), but in the study on elite cyclists above, they were supervised by national coaches with access to advanced facilities, so incorrect bike geometry wasn’t likely to have been a factor. What else could be going on? Well, some research has shown that muscle fatigue may play a role. In one study, scientists demonstrated that when cyclists pedalled to exhaustion, their hamstrings (rear thigh) and calf muscles became progressively more fatigued (as expected). What was surprising, was that this fatigue seemed to produce undesirable changes in muscle movement patterns, which then affected the back – specifically, the degree to which the cyclists were bent forward in the lumbar region and also how far their knees were splayed out. In a nutshell, the more tired these cyclists became in their legs, the worse their spinal posture became. Another study looked at the effects of holding a static bent-forward (flexion) position on the all-important back extensor muscles that help maintain correct posture and stability in the lower back. It found that after prolonged periods of static flexion (when a cyclist is on the drops), these muscles became less effective at generating the forces required to maintain spinal stability and posture. >>> Should you slam your stem? More evidence for this effect comes from Australian research, which compared nine healthy (symptom-free) cyclists and nine cyclists with chronic lower-back pain. In short, the researchers found that the cyclists in the pain group tended to have excessive increased lower back flexion (forward bending in the lower back), which was associated with reduced activity of deep low-back muscles called multifidus – key stabilisers of the lumbar spine. The notion of impaired spinal-movement patterns as a major cause of lower-back pain in cyclists is also supported by Belgian research, which found that cyclists measured riding their own bikes, and who were chronic lower-back pain sufferers, tended to ride with more flexion in the lower lumbar spine. They also tended to experience a steady increase in pain over a two-hour period compared to healthy cyclists. The scientists concluded that rather than poor bike set-up, it was the cyclists’ impaired motor control patterns in the lumbar region that led to poor movement patterns, specifically excessive flexion, resulting in lower back pain. The evidence above points to the fact that cyclists need to be strong in the lower back and core in order to avoid suffering the results of impaired movement patterns. Whilst the pro cyclists included in the study were likely to create most of the damage on the bike, recreational cyclist must also bear in mind that many of their seated hours are not spent upon a saddle. Slumping at a desk whilst at work can play havoc with your back, and the resulting imbalances can then cause issues on the bike. If you spend many of your working hours sitting – at a desk or in a car – try to optimise your set up so that you maintain a straight position, without slumping or rotation. We’ve got a detailed video guide on exactly how to improve your desk posture here. Though lower back pain often arises as a result of weakness or improper movement as a result of fatigue, it is a good idea to assess your bike fit too as this can be a contributing factor. Choosing a bike frame with the right geometry and ensuring the correct riding position on the bike are both crucial to minimising unwanted loading on your lower back as well as your knees, shoulders and neck. Before you look to adjust your bike fit on your steed – make sure you’re riding a frame with geometry that suits you. 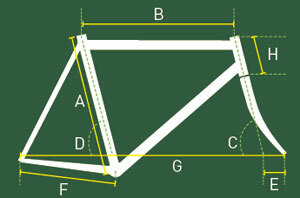 All the different parameters shown below will affect the way the bike handles, but A, B and H (seat tube, top tube and head tube length) need to be correctly matched to your body dimensions. A long top tube, or reach made long by a long stem, can increase the chance of lower back pain. So too can an overly large drop from the saddle to the handlebar – often created by a short head tube or removing all your spacers below the stem, creating a low stack. Saddle height This should be positioned so that when the pedal is at the bottom of the stroke and the ball of your foot is on the pedal, your knee should have a slight bend in it. Hips shouldn’t move sideways during crank rotation and you shouldn’t have to stretch at the bottom of the pedal stroke. Saddle angle This should be in a horizontal position, parallel with the floor when viewed side on (but sometimes a very slight downwards tilt can be helpful for those who experience a lot of pressure in the perineum area). Forwards/backwards position of the saddle With the pedals adjusted so that they are at the three o’clock and nine o’clock positions, a vertical line dropped from just behind the kneecap on the outside of the forward knee should pass through the axle of the pedal. Handlebar position Handlebars should be adjusted so that you neither have to stretch to reach them, or feel confined by having them too close to your body. You should be able to comfortably reach the bars from an upright position and your elbows should be slightly bent when resting on them. In addition, you can also select your desired gear to match the terrain, which means that you can avoid loading your muscles and joints with excessive force, keeping the cranks spinning rather than pushing a big gear. The icing on the cake is that because your feet are fixed in place, spinning the cranks requires very little co-ordination, which also reduces the risk of injury due to poor technique. Still, despite all these advantages, cyclists can, and regularly do, suffer overuse injuries, particularly when spending long, hard hours in the saddle – for example, when preparing for a big sportive.